UPDATE: The You Tube clip has now been pulled by the The Australian Workers Union and is no longer able to be viewed where originally posted , no reason is given for the removal but it was a voluntary action and although that does not indicate in its self that copyright was used I bet that some pressure was applied either way. So my article below has been proved correct, I however have found another copy so its not dead and that is what I have been saying , delete means nothing on the internet watch it here why you still can and of course still read the article. 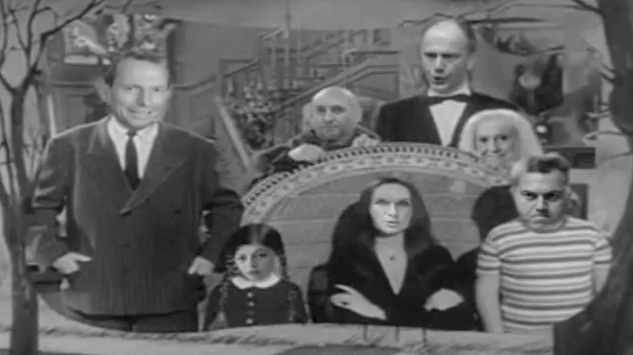 I was writing another story when I just caught the end of Today on Channel 9 in Melbourne Australia and they alerted me to this You Tube video using a spoof of the Adams family to lampoon The Federal Australian Liberal Party portraying them as the Abbott Family. I don’t think this is particularly creative or becoming of a political advertisement and already a spelling mistake has been identified and that the producers of the clip don’t under stand the difference between their there’re and their, but hey that’s happens on the internet all the time. It was created by The Australian Workers' Union. Australia is in the grip of a federal election campaign and the airways and the internet is full of political comment and advertising and indeed it is an interesting election campaign after the recent dumping of Kevin Rudd for his heir apparent a few weeks back I wrote a commentary back then you can read here. But that is not I want to tackle here, avid readers would note that I write quite often of copyright and its abuse and here I think we have a classic case that propels politics and the real issues of copyright and fair use together. Will this clip last the distance until 21st August 2010, Election Day? I wrote just as recently as Saturday about respect and that I believe this is what is lacking from copyright, and that fair use is paid lip service. It was the story of an Auschwitz survivor who had a video that celebrates this fact yanked from You Tube on copyright grounds as it used the Gloria Gaynor’s song I Will Survive, you can read my post and the details here. The Adams Family n 1964, the ABC-TV network created a television series based on Addams's cartoon characters. The series was shot in black-and-white and aired for two seasons in 64 half-hour episodes (September 18, 1964 – September 2, 1966). The TV series featured a memorable theme song, written and arranged by longtime Hollywood composer Vic Mizzy. I would guess judging by the details above that copyright would exist in this clip that they have used, it appears to have been video edited and altered and so might be a derivative work. This could be considered parody but it also is a political ad. I don’t know but I suspect that this will disappear very quickly. Now because of my political beliefs I really don’t care if this survives or not, it's just it will be interesting what happens here and that I am divided on the outcome. If is political speech and if copyright is used to silence it, what harm have the copyright holders suffered? What lost sales, what good are they denied? Does copyright become an even greater power bestowed on the holders than was originally intended, one that allows then to stifle non related debate? This show is long gone and we all have a little bit inside our heads after all the reason this clip was chosen is that it has an image that was already created very successful all those years back, but that image also exists in our heads and that is what the ad is exploiting not the value of the work but the associations. 2010. What do you think? Is the Abbott family clip fair use? judge for yourself and leave a comment love to hear what you think.